Citation Information: J Clin Invest. 2007;117(12):3660-3663. https://doi.org/10.1172/JCI34237. In this issue of the JCI, two reports provide intriguing new information on the role of the inflammatory cytokine IL-6 in breast and lung cancer. The study by Sansone et al. implicates IL-6 in the instigation of malignant properties in breast cancer stem cells (see the related article beginning on page 3988). The study by Gao et al. identifies mutant variants of EGFR as inducers of IL-6 in lung adenocarcinomas (see the related article beginning on page 3846). These studies add to our understanding of potential roles for IL-6 in cancer and further motivate investigations of IL-6–targeted chemotherapeutics. Models for role of IL-6 in breast and lung carcinomas. In this issue of the JCI, Sansone et al. (6) show that the tumorigenic conversion of mammary stem cells (CD44hiCD24lo) results in an increase in IL-6 expression and secretion. IL-6 secretion results in a positive feedback loop causing further IL-6 upregulation and secretion. Once secreted, IL-6 can bind the IL-6 receptor (IL-6R), causing the upregulation of the Notch-3 ligand Jagged-1, which triggers the upregulation of CA-IX. While not depicted here, it should be noted that Jagged-1 is a transmembrane ligand. The result of these changes is the promotion of malignant features in these mammary stem cells. Also in this issue, Gao et al. 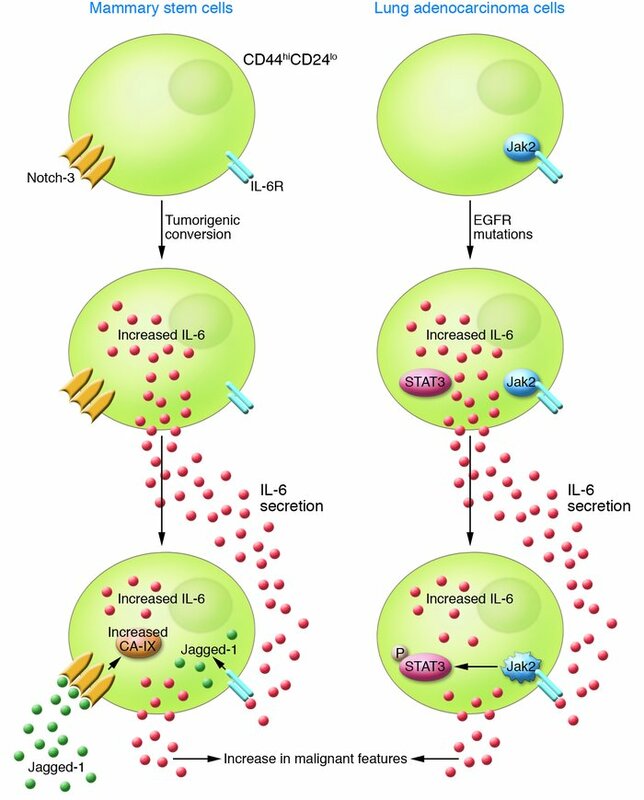 (7) show that EGFR mutations in lung adenocarcinoma cells cause an increase in IL-6 expression and secretion. This, in turn, promotes malignant features in these cells through the IL-6 receptor activation–mediated phosphorylation of STAT3.